Many companies use freebies to boost sales. Since 1983 Red Rose Tea has included miniature figurines inside selected boxes of their tea. The figurines were produced by the Wade pottery firm and keen Wade collectors, particularly Wade Whimsies collectors, should know and understand the history of these figurines. So, here’s that history with descriptions of all eight Wade Whimsies series issued by Red Rose Tea to date. 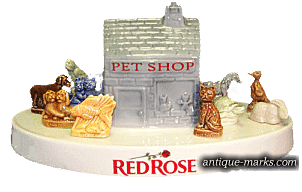 It was in the USA in 1983, when Red Rose Tea first introduced miniature Wade Whimsies porcelain figures as premium giveaways in boxes of tea. The figurines were manufactured by George Wade & Son Ltd, a British pottery firm that had begun life in Burslem, England in the nineteenth century. Through the years Wade, which has had many name changes and operated from several locations, has made an array of ceramic products, including tableware, giftware and products for industry. 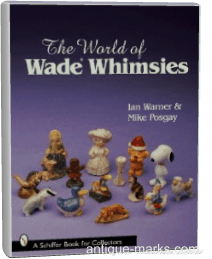 But by 1953, according to ‘The World of Wade Whimsies’ by Ian Warner and Mike Posgay, British Government orders for porcelain electrical insulators had dropped at some Wade potteries and the company had to look for other products to manufacture. According to the books authors, Iris Lenora Carryer, (daughter of George Albert Wade who helped run the family business), suggested that the company manufacture figurines as promotional items for other retail businesses. The figurines sold as boxed sets and companies in Great Britain purchased them to help promote sales. The miniature porcelain figurines were named Whimsies. The first set appeared in 1953, consisting of animal figures including the fawn, spaniel, horse, squirrel and poodle. The first time Red Rose Tea had packaged figurines in its tea boxes was in Canada in 1967. The figurines were such a hit that in 1969 the British arm of the company began offering them locally. Though this was the first time Wade had made figurines as promotional items for business, it had been making larger figures of animals and glamorous women since the late 1920s. However, the start of World War II had halted production of these items. Before packaging the Wade Whimsies in Red Rose Tea boxes, Red Rose in America had carried out test runs in the 1970s in Pittsburgh and the Pacific Northwest. The American Series #1, (1983 to 1985) consisted of 15 figurines, with one Whimsies packaged in each box of Red Rose tea. The first animal series included a chimp, lion, bison, bush baby, owl, bear cub, rabbit, squirrel, bird, otter, hippo, turtle, seal, wild boar and elephant. This series was identical to earlier pieces from a retail line of Wade Whimsies except that the glazing process for the U.S. market was simpler than it was for other markets. 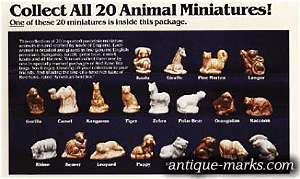 The second series, also of animals, was issued from 1985 to 1996 and totaled 20 figurines. It was selected from a group that had also first appeared in earlier Wade series. The principal distinction between the American and other-market premiums in this series was in the glazes. The first 15 figures were issued between 1985 and 1995, and an additional five were issued in 1990. All 20 were available until 1996. The animals represented were the giraffe, koala bear, pine marten, langur, gorilla, kangaroo, tiger, camel, zebra, polar bear, orangutan, leopard, rhino, raccoon, leopard, puppy, rabbit, kitten, pony and cockateel. According to Red Rose Tea, since the inception of the Wade giveaways, more than 300 million Wade Whimsie figurines have been included in tea boxes in the USA. Though the collectibles were originally intended for children, they are probably more popular with adult collectors. Series III – The Circus Animal Series (1994 to 1999) was the third to appear. Fifteen figurines made up this series, including; ringmaster, human cannonball, strongman, clown with drum, clown with pie, bear, sitting elephant, standing elephant, male monkey, female monkey, lion, poodle, seal, horse and tiger. A porcelain circus ring produced as an extra for displaying the Wade Circus Whimsies was sold separately. The first five figures listed were produced from new molds. 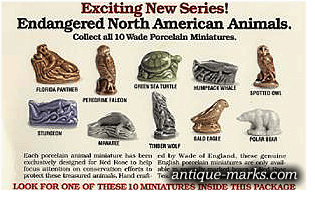 SERIES IV – Endangered North American Animals ( 1999 and 2002 ), was the fourth series. The 10 figurines were the spotted owl, bald eagle, polar bear, peregrine falcon, humpback whale, Florida panther, manatee, green sea turtle, timber wolf and sturgeon. The series appeared between 1999 and 2002 and the last seven molds were all new. SERIES V – Noah’s Ark was the fifth series. Fourteen male and female animals, representing seven kinds of wildlife, and a single figurine of Noah and his wife made up the set of 15. They incude the elephant, rhino, zebra, goose and gander, hen and rooster, ram and ewe, lion and lioness and Noah and his wife. 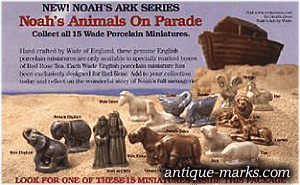 A separate ceramic Ark was sold by mail, which was used to display the Noah Series. SERIES VI – Pet Shop Friends ( 2006 to 2008 ) was the sixth series. The 10 animals appearing between 2006 and 2008 were the duck, pony, rabbit, turtle, kittens, puppies, Labrador, budgie, tropical fish and cat. A separate ceramic base with a pet shop structure at its center was sold by mail for displaying this series of Wade Whimsies figurines. SERIES VII – The Wade Red Rose Calendar series ( 2008 to 2012 ) was the seventh series. One figure representative of each month was included from 2008 to 2012: snowman, cupid, leprechaun, Easter bunny, Mother’s Day flowers, graduation, Uncle Sam, sandcastle, scarecrow, pumpkin kitty, turkey and Christmas tree. SERIES VII – the Nautical Wonderland Series, the eighth and current series, was introduced in 2012. The series includes the compass, conch shell, mermaid, ships wheel, treasure chest, divers helmet, lighthouse, sailboat, seagull, seahorse, crab and starfish. By collecting UPC barcodes from Red Rose tea products, (other than the 100-count original variety in which the Wade Whimsies are now packaged), collectors can obtain the missing figures missing from their collections free of charge. Alternatively, collectors can visit the Red Rose Tea website. and purchase almost all the complete series, with most still available. Collectors keen to meet other Wade collectors in person, to enjoy and compare a wide variety of Wade Whimsies figurines, (not just the Red Rose figures), gather in Windsor, Connecticut every October. Each year since 2006, what is now called the Windsor Wade & Tea Fair has been held thanks to sponsorship by the Windsor Chamber of Commerce. Redco Foods, the owner of Red Rose tea in the U.S. since 1988, helped initiate the fair. In July, Wade Whimsies devotees can attend the Summer Wade Fest in Harrisburg, Pennsylvania. First run in 1999, according to Keenan Antiques, the shows sponsor, no Wade show in the USA has run longer. People attending the two-day Summer Wade Fest on the Saturday are rewarded with a free Wade collectible.